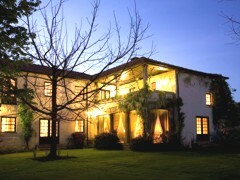 Accommodation at Casa de Santo Antonio de Britiande. This manor house, which has a private chapel dating back to the 17th century, is located south of the Douro Valley, in the small village of Britiande. In the square outside of the house is the old pillory which was moved from the centre of the village. The house was once the home of the local priest and place of retreat for the monks of the Ferreirim Convent. The house was given to the grandfather of the present owner in 1890. Being the most important and respected house in the village, it was the place where all the important "social meetings" were held. This house is a superb example of a typical northern Portugal manor house, decorated with fine masterpieces of art, most of them located in the small chapel, which is often mentioned in history books due to its delightful panel of Portuguese 17th century azulejos (tiles) and carved wood ceiling with a coat-of-arms. There is an interesting panel on one of the walls of the guest sitting room, describing the evolution of the Portuguese Monarchy, which lasted until 1910. Casa de Santo Antonio de Britiande is conveniently located to explore and discover the magnificent scenery of the 'Alto Douro Vinhateiro' – the world’s first Wine Demarcated Region, created in 1756 and classified as a World Heritage Site by UNESCO on 14 December 2001. Lamego has one of the most important Baroque monuments in Europe - the shrine of Nossa Senhora dos Remedios, with its monumental stairway, which dominates the east/west axis of the town. The Se (Cathedral) at Lamego is one of the most beautiful monuments in the country and deserves a visit. A visit should also be made to the museum, where can be seen six remaining panels of the altar piece commissioned from Grao Vasco by the Bishop of Lamego in 1506. All around Casa de Santo Antonio de Britiande, there are beautiful and well kept gardens with apple and cherry trees, giving a peaceful atmosphere in the beautiful scenery. The house provides accommodation for 12 people in three double bedrooms, one twin bedroom and two studios with capacity for an extra bed. All the bedrooms have en suite bathrooms, typical portuguese furniture, and can be centrally heated if necessary. In the grounds of the house and next to the pool area, there is a patio with a wisteria covered pergola where breakfast is served on summer mornings. During the day the maid will serve light snacks or a glass of wine to guests at the pool area. The owner of the house has other estates to the south and in the Douro demarcated wine growing area. They make their own wines and have a tasting room which is located 500 metres from the manor house. Meals are served with prior notice at an extra charge.